CANNONBALL, ND – A week before the Dakota Access Pipeline controversy began creating headlines around the world, 40,000 pounds of poison were spread across open fields, primarily on the Standing Rock Reservation. 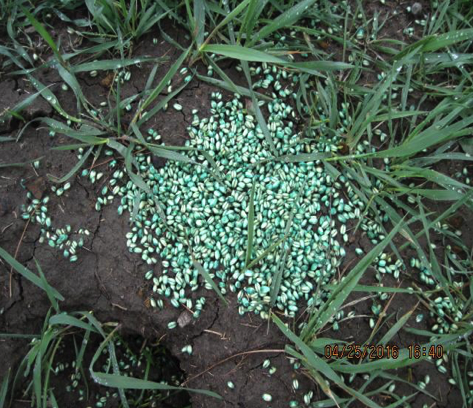 Instead of digging the rodenticide six inches into the ground – like the directions say – the poison, meant for prairie dogs, was scattered across 5,400 acres with a spoon and a bucket, killing bald eagles, buffalo, and other wildlife. The incident is one of the worst Rozol poisoning disasters on record, officials say, and yet more than two years later, David Meyer, the person the Environmental Protection Agency fingered for the reckless incident, has not been charged. The investigation is finished, has been for months, U.S. Fish & Wildlife Service agents report, and they’re waiting on charges. Instead of facing charges the Flasher, North Dakota rancher, sold 7,000 acres of Cannonball Ranch to Energy Transfer Partners, the parent company behind the Dakota Access Pipeline, and David Meyer is one of two entities granted a license to grow medical marijuana in the state. Meyer, the legal representative for Pure Dakota LLC, was granted a license to grow medical marijuana by the state’s Department of Health last May. 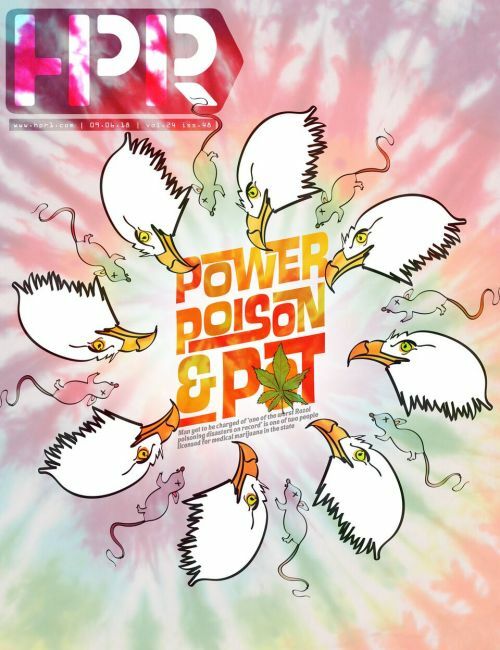 The poison, called Rozol, manufactured by Liphatech Inc., is a restricted-use anticoagulant containing clorophacinone, a chemical highly toxic to all wildlife, having a half-life of up to seven weeks. An applicator must be licensed to apply it, and EPA documents show that Meyer was not certified. The EPA also ordered a cleanup, but documents showed that Meyer did not dispose of dead prairie dogs. 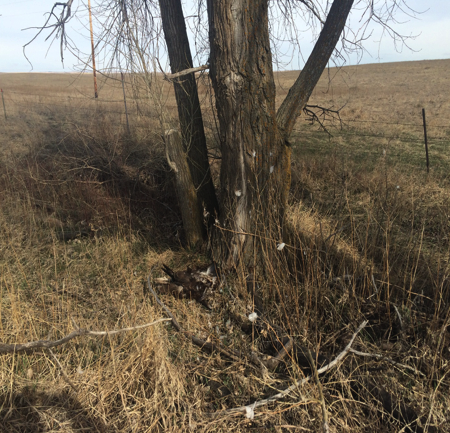 In addition to at least six bald eagles and two buffalo killed on Meyer’s Cannonball Ranch, and on the nearby Wilder Ranch, activists who lived in the Standing Rock camps during the Dakota Access Pipeline protest claim the Rozol sickened them. Some have doctor’s statements supporting the claims. Ernie Fisher, of Bar 33 Bison Wilder Ranch, shares a grazing lease with Meyer, on which more than 600 buffalo roam. Meyer disagreed, saying that the Rozol never came close to populated areas. A cleanup effort was made, he said. According to the EPA report the agency kept tabs on isolated infected animals until September 2017. Approximately 100 yearling buffalos were sold on January 7, 2017, six days after the EPA’s no-sale hold expired. Once Rozol is eaten, an animal may take weeks to die, and in a weakened state becomes tempting prey for predators, such as wolves, who will also become sick and die. Carcasses pass on their poisons to raptors, such as bald eagles and vultures. Even the feces of infected animals are considered a biohazard material. When asked who was responsible for spreading the Rozol, Meyer declined to comment. Rozol is not cheap. In the market today, Rozol sells for $128.8 per 50-pound bag, which would have cost Meyer approximately $103,040. In humans, the poison can be absorbed through the skin and can be just as deadly, causing long-lasting internal bleeding, abdominal pain, fevers, and seizures, according to the Toxicology Data Network. More than 20,000 people from across the world and 350 Indigenous nations passed through the Standing Rock camps in the months following the Rozol incident. In 2016, the Standing Rock Sioux Tribe reported the poison was not spread in areas where activists camped, although protests were held in affected areas. Warnings were issued at that time, but since then, many have reportedly come forward with strange symptoms nicknamed the “DAPL cough,” and for some, doctors have confirmed their fears. “People were bleeding from their ears, and bleeding from their nose. It’s an anticoagulant, your capillaries burst and you bleed from the inside and you don’t even know you’re sick until you come into contact with another poison,” said Sarah McGovern, a lawyer’s assistant in California. “I was hospitalized due to asthma and pneumonia after I got hypothermia there,” Lily Kinkade, who lived at the Standing Rock camps in 2016, said. “I experienced respiratory problems due to Rozol after doctors tested me and discovered that I didn’t actually have pneumonia, and I also had some internal bleeding caused by Rozol. Meyer declined to comment on efforts he made during the cleanup, adding that none of his buffalo died from the Rozol. He did say that he was pleased he received a license to grow medical marijuana. So far, a shed has been built, but no plants are in the ground. Lisha Sterling, of Geeks Without Bounds is also on the board of directors for Front Line Wellness, an organization that emerged from the Standing Rock controversy. She is focused on public health guidelines for resistance camps, which is based largely on the guidelines for refugee camps. The Rozol may have helped save her life, she said. Her doctor told her if her blood hadn’t thinned, she may have suffered a heart attack. Putting together the pieces, the EPA report, the $100,000 misapplication fine, the timing, and the fact that Meyer was friendly to activists until he sold the ranch in October 2016, led her to conclude that the situation wasn’t as simple as it seemed. Sterling spent months in the camps helping with internet connectivity issues. “I think the ‘DAPL cough’ was multiple things, the Rozol may have been a contributing factor because it reduced our immune system,” Sterling said. She started taking Vitamin K and is now free of the lingering symptoms, she said. “The DAPL cough happens in refugee camps as well,” Sterling said. In both situations people cannot escape the existential stress, or living in an unfamiliar environment, or inability to ensure personal hygiene. Although usage of Rozol was widely known since the end of 2016, Energy Transfer Partners seemed confused on whether the poison was applied in its easement application to the U.S. Army Corps of Engineers in February 2017, answering “unknown” and “no” on the FIFRA, or the Federal Insecticide, Fungicide, and Rodenticide Act subsection. Rozol is a heavily restricted pesticide, banned in some areas of the United States. In 2014, the EPA fined Liphatech $738,000 for more than 2,100 violations of FIFRA regulations committed between 2007 and 2008. A year before, Walmart pleaded guilty to violating FIFRA rules for failing to properly handle pesticides returned by customers to its stores across the country. The EPA also reported that findings in 2010 showed that in North Dakota no one picked up and disposed of prairie dog carcasses after applying Rozol. “Though we note that follow-up search protocols may not always be followed, the Service believes that current Rozol label directions to reduce secondary exposure by collecting and disposing of dead and dying prairie dogs… are inadequate to protect non-target species,” the 2010 EPA report stated. Since 2006, the EPA has discovered evidence through forensic autopsies that bald eagles, hawks, wild turkeys, raccoons, foxes, coyotes, squirrels, badgers, great-horned owls, and a bobcat have been killed by Rozol, but rarely on the scale of the incident at Cannonball Ranch. 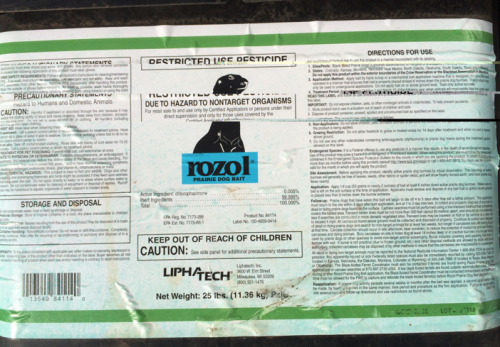 Hard evidence is lacking, and few long-term exposure studies to Rozol have been performed, but based on current evidence Raptors seem especially susceptible to Rozol toxicity, and “are expected to continue to die from Rozol exposure,” the EPA reported. Killing bald eagles is a federal crime under the Bald and Golden Eagle Protection Act, and killing the national bird can lead up to a year in jail and a $5,000 fine. Since the Rozol incident on Meyer’s ranch, the U.S. Fish & Wildlife Service, in conjunction with the U.S. State’s Attorney’s Office for the District of South Dakota, have had time to file charges and prosecute dozens of people involved in one of the largest wildlife trafficking investigations in the Midwest. The investigation began as an undercover operation in 2014, according to the U.S. Department of Justice. “Project Dakota Flyer” led to charges against 31 people and pawnshops – one man from North Dakota – for poaching more than 250 bald eagles from the Montana, Wyoming, and Dakota regions. A pair of eagle wings can sell for hundreds of dollars, while an undamaged whole eagle for thousands, a special agent with the U.S. Fish & Wildlife Service said. Wildlife cases typically don’t take precedence over human crimes, and cases usually take up to six months for charges to follow. State’s attorneys in South Dakota are working with a backlog of cases. 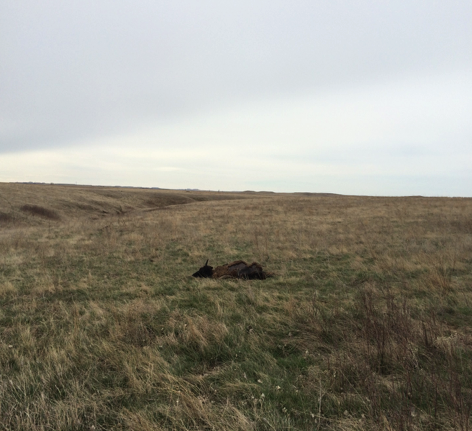 For reasons unknown at this time the state of North Dakota frequently rejects wildlife cases, U.S. Fish & Wildlife Service agents reported. Telephone calls and emails for information to the State’s Attorney’s Office for the District of South Dakota were not returned. One individual soon to be charged during Project Dakota Flyer was found with more than 100 dead bald eagles in his possession, a U.S. Fish & Wildlife Services agent said. Multiple killings could be prosecuted as a felony and is punishable up to two years in prison with a $250,000 fine. While the undercover operation is wrapping up, additional information was sparse pertaining to the David Meyer’s Rozol incident as it is an ongoing investigation. More information related to this Rozol incident may be made available in December, the U.S. Fish & Wildlife Service reported.